Uliassi is the newest restaurant to receive the three-star accolade. The MICHELIN Guide Italy 2019 launched today, featuring a whopping 367 starred restaurants, confirming Italy as the second richest individual guide selection in the world. Catia and Mauro Uliassi’s eponymous restaurant in Senigallia on Italy’s East Coast is the newest three-starred restaurant for the country. Technique and technology with a tradition in constant movement coexist within the kitchen, and this is fueled by the brothers’ travels and their coastal surroundings. The addition of Uliassi to the 2019 selection brings the total number of three-starred restaurants to 10: Piazza Duomo in Alba, Da Vittorio in Brusaporto, St. Hubertus in San Cassiano, Le Calandre in Rubano, Dal Pescatore in Canneto Sull’Ogio, Enoteca Pinchiorri in Florence, La Pergola in Rome, Reale in Castel di Sangro and Massimo Bottura’s famed Osteria Francescana in Modena. Also included in the 2019 guide are 39 two-starred restaurants and 318 one-starred establishments—29 of which are new entries. 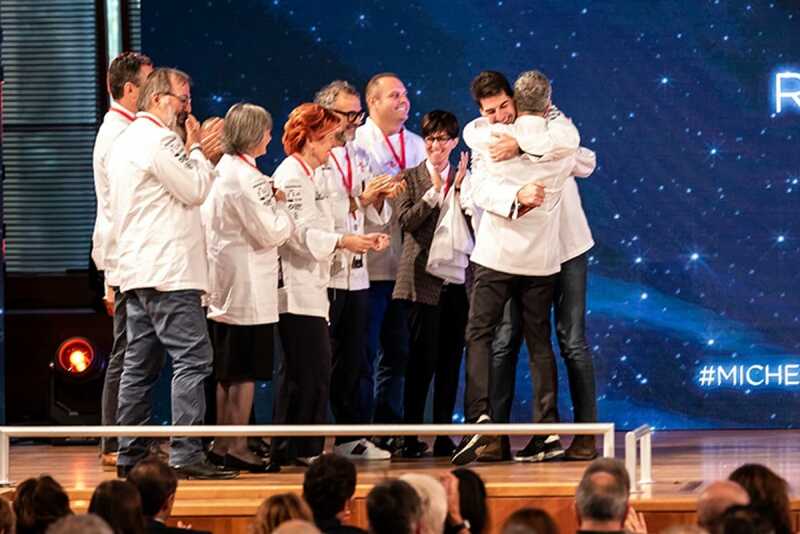 The region with the most new star additions is Piedmont, including Antonino Cannavacciuolo seeing a duo of star awards with one in Turin at Cannavacciuolo Bistrot Torino with chef Nicola Somma, and the other in Novara at Cannavacciuolo Cafè & Bistrot with Vincenzo Manicone. Enrico Bartolini also adds a new star to his collection at the Locanda del Sant’Uffizio Enrico Bartolini with chef Gabriele Boffa in Cioccaro di Penango. In the south of Italy, there is the return of Basilicata in Matera at restaurant Vitantonio Lombardo, and a new star in Calabria at chef “Nino” Rossi’s Quafiz. And in the islands, Heinz Beck achieved a star with chef Giovanni Solofra at St. George by Heinz Beck in Taormina, Sicily, while Italo Bassi regains a star at the ConFusion Lounge in Arzachena, Sardinia. The MICHELIN Guide Italy 2019 also includes 257 Bib Gourmand eateries. Congratulations to all restaurants. View the newly-starred restaurants below.